the Israeli brutal destruction of Qunietira city, southern Syria, expressing his shock over the devastation he saw which exposes the Israeli destructive, occupying mentality. Mr. Diaz described this destruction as unprecedented brutality and terrorism, stressing his country's support to Syria with regards to regaining the occupied territories. 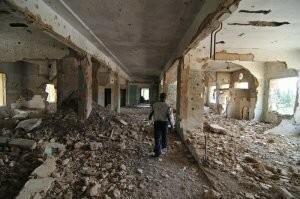 Ruins the Syrian government has maintained for thirty-five years: a hosptial interior in Quneitra. Comments: (1) How come, 35 years and one day after the negotiated return of Quneitra by Israel to Syria on June 26, 1974, the town remains unrebuilt? Because, to make a propaganda point, its population has been prevented all these years from returning to the town and resuming their lives. (2) Damascus is acting illegally in not rebuilding Quneitra, for it was returned under the Separation of Forces Agreement Between Israel and Syria of May 31, 1974, of which paragraph B(1) (f) requires that "All territory east of Line A will be under Syrian administration, and the Syrian civilians will return to this territory." a Los Angeles Times article of June 12, 1967 included a sub-head which referred to Al Koneytra (i.e. Quneitra) as the "ruins of [a] captured town." The article reported that "Al Koneytra was a town of smoldering ruins. Heavily armed convoys patrolled the debris-covered streets," and "Life was at a virtual standstill, with all shops closed or wrecked." This damage, obviously the result of the just-concluded war, occurred a full seven years before Israel's supposed spiteful bulldozing of the town. Soon after the war, Syria began regularly shelling Quneitra. For instance, a New York Times dispatch of June 25, 1970, headlined "Fighting Flares in Golan Heights as Syrian Tanks Attack Israelis," reported that Syria had shelled Israeli positions in the Golan for three hours, hitting "El Quneitra, Nahal Gesher and Ein Zivan." And a Times story on September 2, 1972 referred to the one inhabited street in the town and Israeli soldiers training "a block or two of ruins away." Yet another Times story, this one on November 26, 1972, was headlined "Syria Shells Israeli Bases in Occupied Golan Heights," and reported Damascus radio's announcement that Syrian artillery had shelled "Kafr Naffakh and El Quneitra." On October 11, 1973, during the Yom Kippur War, another Times report told of a Moroccan brigade joining Syrian forces "in an attack on El Quneitra." And in an article on October 21, 1973, the Times reported that while the UN observation station in the town had survived the war intact, Quneitra itself was "a bombed-out military town the Syrians lost to the Israelis ..."
Finally, a report in the British Times newspaper of April 5, 1974 referred to Quneitra as "the ruined capital of the Heights."